Co Knol is My Peony Society’s resident peony expert. 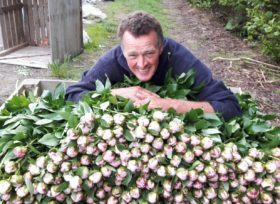 He has been growing peonies for over two decades, knows every secret and trick of the trade, and he helps our growers to raise the bar even higher. Let’s get to know our new personal trainer! Ever since he began working as a foreman at a peony nursery in Andijk, all the way back in 1979, peonies struck a chord in Co. The wild diversity in colours, varieties and shapes stirred something inside him; a peony passion was born. That passion has only grown over the past 20 years, as well as Co’s expertise and craftsmanship. As of 2014, he shares it with the world through his own, independent nursery farm. “I follow my own vision, cultivating peonies to the best of my ability. I think the results speak for themselves!” His nursery is one and a half hectare in size, and home to many different varieties, from Sarah Bernhardt to Alertie. To keep the structure of the soil nice and airy Co keeps all heavy machinery off his land, instead of doing everything – lovingly – by hand. My Peony Society’s resident peony expert Co will be assisting growers, hopefully raising the level of quality even further. Co’s experience and knowledge, gained over twenty-odd years as a peony fanatic, will benefit others. ‘Together with growers I’ll take a look at their plants, and where we might improve. I’ll make spray schedules, review and analyse the harvest, and I can give advise on soil care, climate, pest control, cutting and sorting.’ Or, as we like to say, Co will be the first ever ‘personal peony trainer’.